The wearing of stoles has been associated with both ancient Hebrew and womens' traditional religious garments, though many sources link the wearing of stoles to the establishment of Christianity within the Roman Empire. 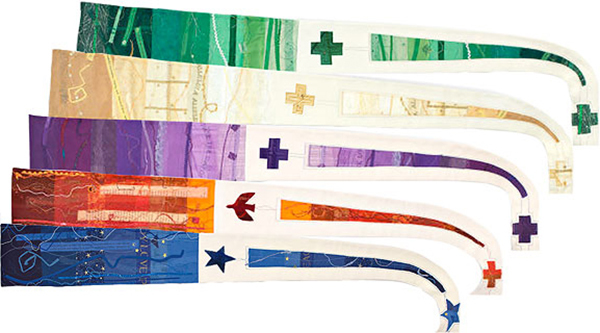 Celebrants may choose stoles in a range of colors to mark different periods in the ecclesiastical calendar or life events for members of the congregation. The green stole is worn during "Ordinary Time," the largest portion of the Liturgical Calendar. The blue stole is worn during Advent, the time of preparation beffor Christmas. The purple stole is worn during "Lent," the weeks leading up to Easter Sunday. The red stole is worn during "Pentecost," celebrated 50 days after Easter. The white stole is often worn for holidays and special occasions, such as weddings, Christenings, and confirmations.